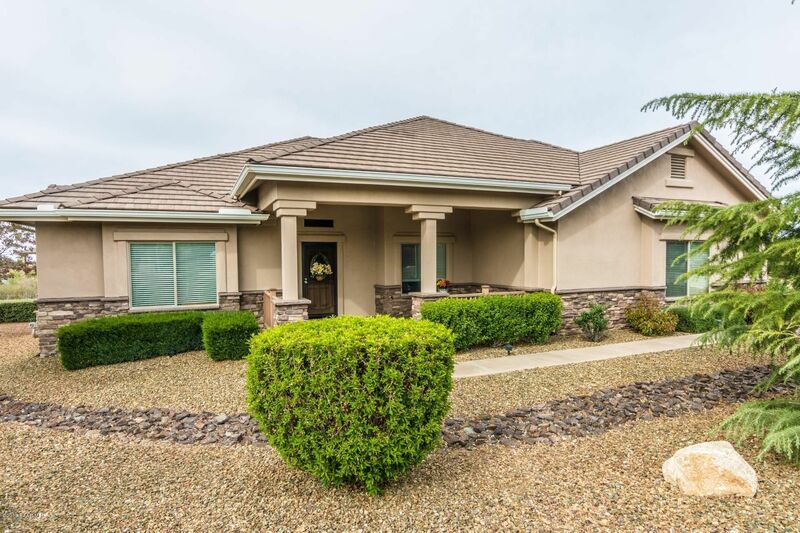 Location, Location, LocationBeautiful, Immaculate custom home in one of Prescott's most prestigious areas, THE ESTATES at Prescott Lakes. Estate sized 2/3 acre lot affords privacy and tranquility. Single level living. Vaulted and open Great Room features a Gourmet Kitchen with a large island. Raised panel Hickory Cabinetry, Five burner convection oven, spacious pantry and wine rack are but a few of the kitchen features. Dramatic floor to ceiling Great Room gas fireplace makes for a cozy atmosphere. Stunning Views of Mingus Mtn and Glassford Hill. There are two separate and spacious living areas. Private Trex Deck with wrought iron, stucco and stone fenced rear yard.The spacious Master bedroom is complete with a garden tub, shower and dual sink en-suite. Oversized 3 plus car garage.